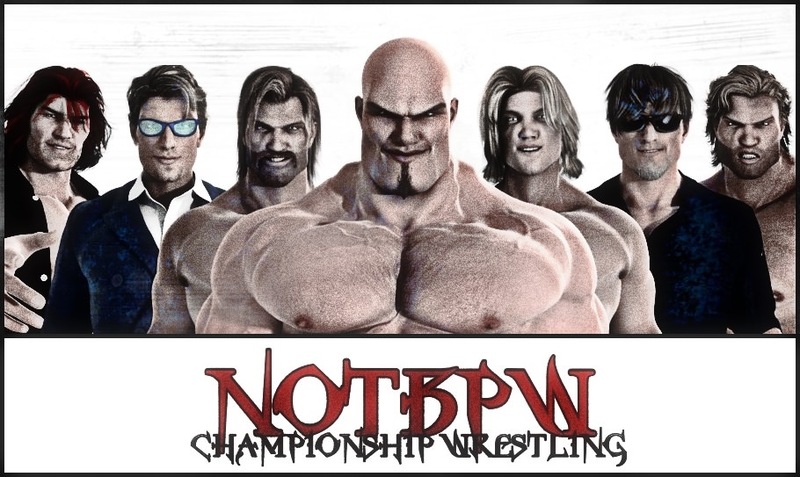 Eight men on the rise here in NOTBPW. The Natural makes a great mentor for young Solomon Gold, and the two 'American Blondes' did a number on Ernest Youngman early on. Dean Waldorf tagged in though, and he and Marv Statler used their experience advantage to isolate and dominate Gold. He couldn't get the tag, and with Sean Deeley calling the shots, Gold was in real trouble. Eventually though, the youngster somehow made it to his corner, and in came Sonny Wildside. The charismatic star flew around the ring and took Shooter after Shooter down. Thrill Seeker was the man to score the win though. He hit his 'Daredevil Drop' finisher on Ernest Youngman and pinned him. As soon as the opening match was over, 'The Ace' Aaron Andrews appeared through the crowd behind the announce desk, and attacked Edd Stone!! He knocked Stone's headset off with a vicious clip across the back of the head, and then proceeded to lift his shirt up over his head in a fight that resembled a hockey brawl!! Edd wildly tried to swing at Andrews but he didn't come close, and Andrews was able to grab Edd and slam him into the announce desk... After a few more shots to the head, Andrews let Edd get to his feet, and then kicked him hard in the stomach... This caused Edd to fall backwards and roll, which created enough space for 'The Animal' to roll, and then run, away from his attacker!! Andrews grabbed a microphone!! Backstage, 'Awesome' Wade Orson was looking for POISON, the man who attacked him last week... He ran into 'Gentleman' Lord James King, who is Orson's biggest rival since he arrived at NOTBPW... Orson asked King if he'd seen the man known as POISON anywhere... and King was less than accommodating... He told Orson that he hadn't seen him... But if he had, there's no way he would tell Orson anyway... After a very unhelpful conversation with LJK, Orson continued his search for POISON... If he finds him, he'll surely want to rip his head off!! An exciting and fast-paced debut for The Montero Brothers, in a match where they showed a lot of what they're capable of, but still left a little back. Their opponents didn't put up much of a fight, but the crowd popped huge when Gino Montero slowly set his victim up for his 'Destiny Explosion' finisher, which did the trick. That move looks like it'd be tough to kick out of. Even for Cameron Vessey and Christian Price. The Montero Brothers have a date with the NOTBPW Tag Team Champions in two weeks at Summer Smash!! So it'll be six men with a point to prove at Summer Smash!! But how will 'Mainstream' James Hernandez come out of this match with a win?! Not only does he have to defend his Title against FIVE other men... but he also has to do it just 10 nights removed from a battle against the undefeated 'Monster' Gargantuan, which goes down a little later on tonight... If Hernandez is still the NOTBPW Television Champion in two weeks, he will probably go down as one of the best Champions in the history of the Title... and potentially... one of the luckiest men in the world!! Donte Dunn may just have put in the performance of his career here! He's spent the past year settling in to NOTBPW, but hasn't really had that 'stand-out' performance. Tonight was that performance. It helped that he was in there against 'Wild Man' Jack DeColt; a very experienced competitor who knows exactly what he's doing in the ring. Dunn gave as good as he got tonight, and he hit DeColt hard with a number of strikes and kicks. For the finish though, 'The Barbadian Barbarian' was put down by DeColt's awesome 'End of Days' finisher! Dan, Frost, Robin and Logan took their leave, and Alex sat calmly as they exited his office... As soon as the door was shut, he picked up his iphone and THREW it at the door in fit of rage!!! According to Dan DaLay... next week he'll finally reveal the 'secret' he's been holding over Alex for weeks now... With the truth finally out there, will it mean Alex can relax a little and focus on other things...?! He has a show to run after all... Speaking of which... Up next, we had a match that Alex booked two weeks ago... 'Champion versus Champion'... 'Streak versus Streak'...!!! James Hernandez must have known before the match that he was going to be in for the fight of his life tonight. He's been in great form, being undefeated for a number of months now. But he was in the ring against a legit 'Monster' in Gargantuan! He knew he stood no chance toe to toe, so he used 'strike and move' tactics to stay out of Gargantuan's grasp. Things took a serious turn when Hernandez was slammed shoulder first into the ring post though, and he looked in a lot of pain. Gargantuan followed Hernandez out of the ring, and the two of them brawled all around the ringside area. For the finish, Hernandez was able to catch an on-rushing Gargantuan with a drop-toe-hold, and 'The Monster' hit his head on the guard rail. All of this occurred as the referee was counting up to ten. When he got to ten, Hernandez was just inches away from climbing into the ring to win the match, but it ended in a draw due to double count out! Nobody could quite believe how close James Hernandez just came to defeating Gargantuan!! 'Mainstream' Hernandez needed the rule to be an eleven count, and he would have got the victory by count out!! 'The Monster' made a mistake tonight. He let his anger and aggressiveness get the better of him, and charged at Hernandez... If he can be this angry and aggressive against Hernandez, how will he react in TOTAL WAR against Steve DeColt in less than two weeks?! Another question that needs to be asked, is why did such a huge match not Main Event the show?! Last week's Main Event was Steve DeColt against a mystery opponent, just like tonight... and last week the mystery opponent was an underwhelming Akima Brave... As for tonight's mystery opponent... He's a massive name!! Wade Orson was backstage again next, searching for the man known as POISON!! He bumped into the NOTBPW Tag Team Champions Cameron Vessey and Christian Price... The cocky duo known as 'Primed For Progress' mocked Orson for his obsession with POISON... But they also had an interesting offer for him... They said they needed a 'third member' of Primed For Progress, and that he'd be an 'Awesome' fit... Because they need someone to carry their bags and clean their wrestling gear!! Orson was angry, but he couldn't attack due to being outnumbered, so he just stormed off to continue his search... Lurking in the shadows behind him though, was none other than POISON himself... Presumably following Orson around and making himself impossible to find!! Aldous Blackfriar and Mutant were in a dimly lit room next... talking about the chance they will finally get at Summer Smash!! They'll finally get the chance to earn a Tag Team Title shot, as they take on The American Blondes (The Natural and Solomon Gold) AND The Ring Generals (Marv Statler and Dean Waldorf) in a triple threat tag team number one contenders match!! The winners of the match will be the next in line to fight either the current Champions: Cameron Vessey and Christian Price... or their challengers at Summer Smash: The Montero Brothers!! The Main Event was next... and after an underwhelming 'mystery opponent reveal' for last weeks Main Event, involving the same man as tonight: Steve DeColt, the fans were unsure about who would come out... Last week, it was Akima Brave... The big Samoan put in a good performance, but he was never going to be a serious threat to 'The Outsider'... Tonight was a little different though... Even if the fans were told that this mystery opponent was a non-NOTBPW employee... Even if they knew that this man was a former 2-time World Champion in the United States... and even if they knew that this man was Canadian by birth... They STILL wouldn't have guessed who came through the curtain to fight Steve DeColt tonight...!! Steve DeColt looked like he'd seen a ghost when Angry Gilmore headed to the ring. What he'd actually seen was a man who could very well take his spot at the top of the tree on NOTBPW!! The ovation for almost everything Gilmore did was huge, and both men received a standing ovation after 12 minutes of an absolute slog fest. Both men slowly rose to their feet, and began throwing bombs again, but it was Gilmore who came out on top this time! He hit a brutal forearm smash that almost shattered DeColt's jaw, before following it up with a kick to DeColt's knee, and then a DDT! From then on, all DeColt could do was try to hold Gilmore at bay. He faced an onslaught from the newcomer, the likes of which he'd not seen in a 1 on 1 match for a long time! In the end, Gilmore headed to the top rope, and hit his 'Sky High Elbow' drop, to score the pinfall victory on his first night! Angry Gilmore made a statement with that victory, over the veteran Steve DeColt!! It was a good start to Gilmore's NOTBPW career, but what's next for the new signing...?! 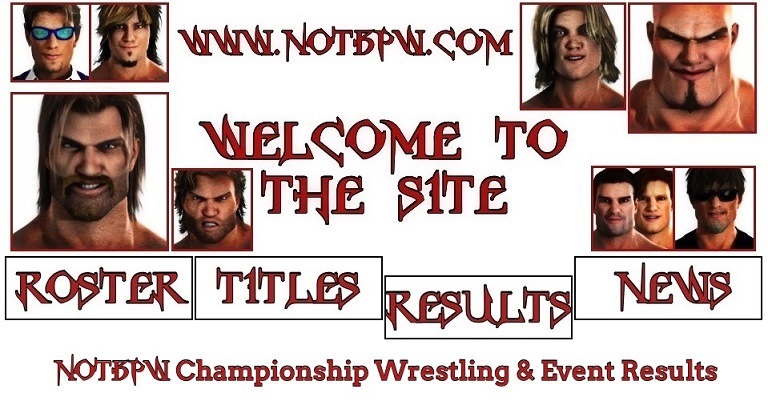 We know that in two weeks, we're going to see a One Night Single Elimination Tournament, with the winner getting a NOTBPW Television Title shot at September pay-per-view: 'The Scramble'... 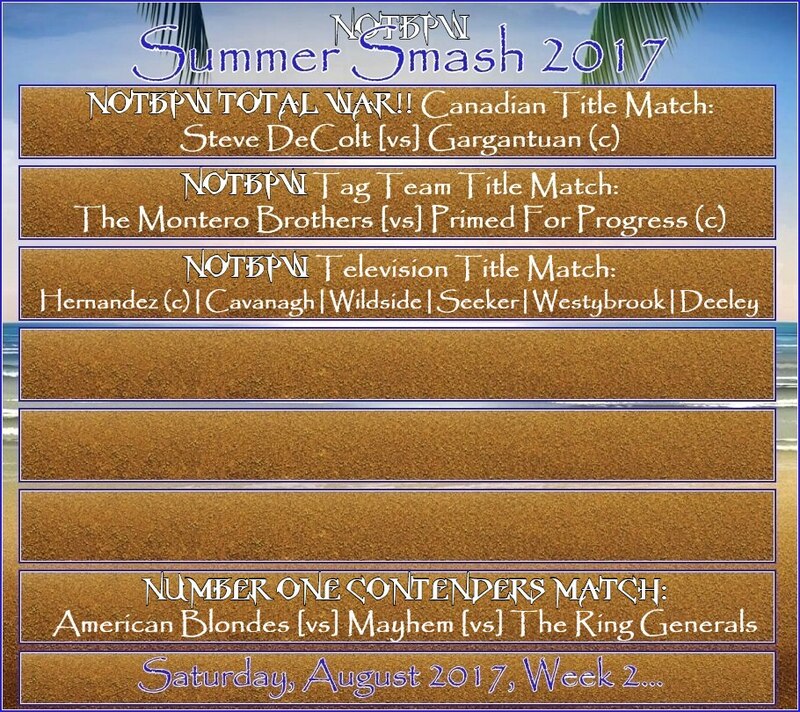 Participants will be announced next week, but before all of that, we have Summer Smash coming next Saturday... With Steve DeColt losing just 10 nights before he faces Gargantuan for the NOTBPW Canadian Title... and Gargantuan only managing a draw against James Hernandez... who has the momentum heading in to Total War...?! No news tonight... Nothing huge happened in the wrestling world... I'm personally chuffed with the signing of Angry Gilmore, but his first Main Event rating was poor... Hopefully his scores improve in the coming weeks and months so he can be a mainstay at the top of the NOTBPW roster!! Last edited by The Lloyd : 11-22-2018 at 01:45 PM.